Claverdon Forge is yet another British smithy with a horseshoe shaped door, although this one is the most rustic and broad-toed one I've seen. It's wooden rather than stonework, but it's still there. This type of construction is called "half timber". And it looks cozy in there! Apparently, the building is still there--it's in Warwickshire, England, not far from Coventry and Stratford-upon-Avon--but no longer used for shoeing horses. Appropriately enough, it's a stove and chimney shop, called "Sparkes Ltd.". More photos, including what the timbers look like from the inside, are on the Sparkes website. 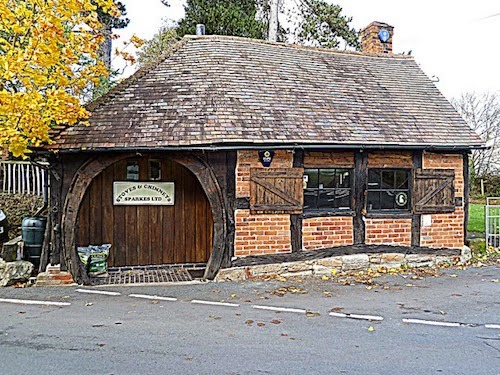 The smithy is a "listed" historic building in England; the official record dates it to the late 17th century. And that's old! Here's a lovely old photo taken in 1955. 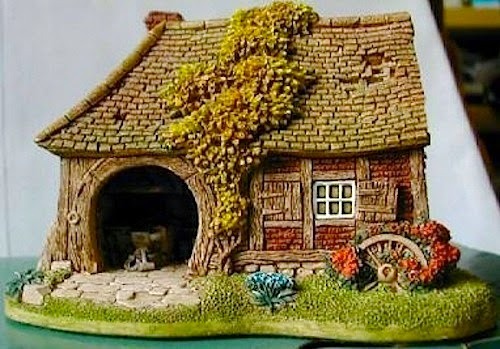 Apparently this forge is of some fame; it was the inspiration for a collectible by Lilliput Lane called "The Little Smithy". I keep searching for photos of these old smithies with horseshoe-shaped entries and I keep finding them, but have yet to find one that is still operating as a smithy. They are tea rooms, condos, bed-and-breakfasts, yarn shops, gas stations, a post office--you name it. But none I have found so far are being used for their original intent. Thanks to BellBowe51 on Flickr.com for documenting Claverdon Forge for us. Hey Fran, In addition to looking like a right front, there must have been some medial wall missing, as I only see one nail medially. Do those heels looked wedged to you? And dare I say, the shape of the toe looks suspiciously like a Fitzwygram!! Great photo! On the subject of old forges. When I was an apprentice, back in the "olden days" as our son would say, we used to stop for a visit at the forge attached to Powerscourt House just outside Dublin. I'd be surprised if it's not still in use. If I find out I'll let you know. Gerard, I know the very forge you mean, at Powerscourt House (now a Ritz Carlton resort!) in Enniskerry. I have been in touch with some townspeople there who have been trying to preserve it. I have always wanted to visit that one especially and hope to one of these days! I believe it is the ultimate!